What is the Mission of the Fl. Brain Tumor Assoc. What is the Mission of the Florida Brain Tumor Association? 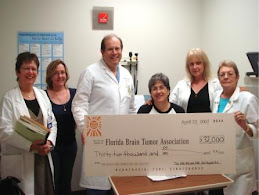 The Florida Brain Tumor Association is a not-for-profit, 501 C-3 grass roots organization. It was founded in 1991 by a 1.5 yr. brain tumor survivor, who recognized the desperate need for information and hope for others struggling with the same disease. It began in Boca Raton, Florida as a support group with a handful of people, led by one professional facilitator at Boca Raton Community Hospital. This group still exists today, eighteen years later at the same meeting place, meeting twice a month, every 2nd & 4th Thursday, 7-8:30 pm. No longer just a handful of people, in fact quite a large, upbeat group with 4 facilitators that after introductions,branch into meetings of family & survivors. Additionally, there are 3 support groups across the state of Florida. If you are interested in these meeting times and locations, please go to: http://www.fbta.info/, click on " All about Us". All meetings are professionally facilitated and free of change and open to anyone who needs support, hope and information or just a safe place to hang and be yourself. The Florida Brain Tumor Association has become a major force in the brain tumor community, hosting 17 brain tumor 2 and 3 day conferences. These conferences have attracted thousands of brain tumor survivors, family members and healthcare professionals in the United States and Canada. Our presenters have been some of the most renown experts in the brain tumor community. The FBTA has an all voluntary staff of officers as well as Medical Advisory Board Members. They are committed and dedicated to the brain tumor cause and are available to help with their gifts of time whenever needed. The FBTA depends on the generous donations from individuals,organizations and sponsors. During the first week of May each year, during BTAW, (Brain Tumor Action Week) several of the FBTA members can be found in Washington DC lobbying and advocating for the rights and needs of brain tumor survivors. This is a very active, vocal organization. Various fundraising activities each year make it possible for the FBTA to give substantial research gifts to brain tumor labs in major brain tumor centers each year in Florida. This past April, a gift of $50,000 was given to H. Lee Moffitt Cancer Cancer & Research Institute in Tampa, Florida to be used towards their brain tumor lab. We have promised to match that for this year. The Florida Brain Tumor Association believes that a cure will be found through continued brain tumor research. Our medical advisory board is made up of prestigious researchers and physicians (http://www.fbta.info/) from leading medical centers around the country who are in need of crucial support that not only fuels today's ideas,but helps launch the careers of scientists who may further our understanding of brain tumor disease for years to come. Due to the dedication and commitment to the brain tumor cause the Florida Brain Tumor Association has made a difference in the quality of life to brain tumor patients and their families. The truth is many battles have been won...but there are certainly many more to come and it's not nearly the end of the war. Brain tumors are still the number 2 cancer cause of death in children 21 years and younger. With your help, once day a cure to brain tumors will be found or at least become a manageable disease. Please support our mission by making a tax exempt organization. It could be Worse, It Could Be a BRAIN TUMOR!! Learning every day how to walk in the rain.